Arizona's largest power utility, APS, has now thrown the switch on 34 MW of new solar power generation, and both projects are located in the town of Gila Bend's new Solar Overlay Zone, which has been designated as an area for fast-tracking the permitting of new solar photovoltaic projects. 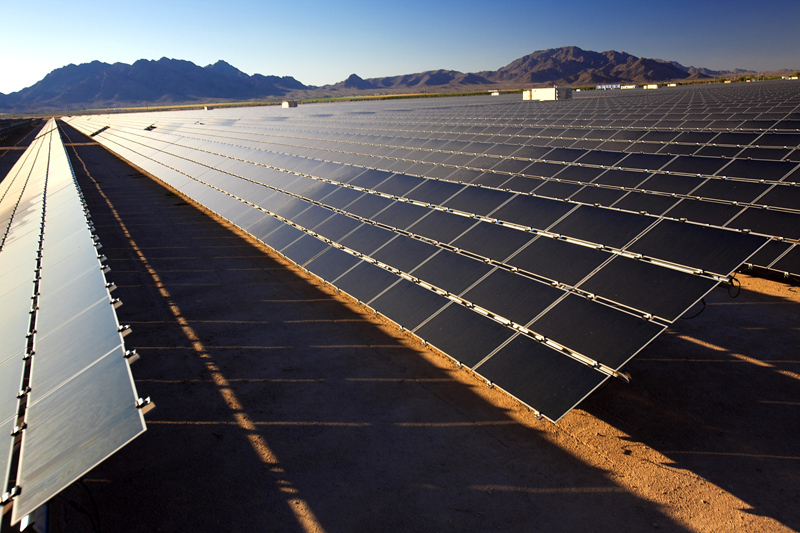 Arizona Public Service's (APS) $500 million AZ Sun Program. APS, the state's largest utility, has thrown the switch on the first 34 megawatts (MWs) of new solar power generation for its customers, which is part of its goal to produce 100 megawatts by 2014. Driven by the state's renewable energy standard (RES) objectives and APS customer demand, the AZ Sun Program will ultimately bring six APS solar projects into production. The first two, which recently started production, are the 17 MW Paloma Solar Power Plant and the 17 MW Cotton Center Solar Power Plant. They are located in close proximity to each other in Gila Bend, 70 miles southwest of Phoenix. While both projects tap into the power generating capability of the sun—which not surprisingly shines nearly every day of the year in Arizona's arid climate—they feature different technology and deliver different attributes to APS's daily power consumption pattern. The Paloma facility consists of 275,000 thin-film photovoltaic panels mounted on fixed-tilt steel supports with SMA inverters while the Cotton Center facility uses polycrystalline panels mounted on a single-axis tracking system. It consists of 93,000 solar panels arranged in preconfigured one-megawatt fields designed to help utilities quickly scale to capacity. The site also incorporates developer SOLON's single-axis trackers and SCADA system for remote control and tracking. The Paloma facility will peak in its power production daily when the sun shines directly on the panels while the Cotton Center facility will produce power at a more consistent daily rate as the panels track the sun's path. "Interestingly, if you look at the amount of megawatt hours produced at the end of each year, they both produce nearly the same," says Ted Geisler APS AZ Sun Program manager. "They both offer a bit of a different curve of energy production, but at the end of each year, they produce the same amount." The other four projects at various stages of approval and construction as part of the AZ Sun Program are the Hyder, Chino Valley, Luke Airforce Base, and Yuma projects. The first three projects were vetted and approved as part of a Request for Proposals (RFP) process initiated by APS. The Yuma project is currently in the RFP stage. The goal is for APS to own and operate the facilities, but the facilities themselves are being constructed by third parties. This is the first time that Phoenix-based APS is actually owning its solar power production facilities rather than relying on third-party suppliers to meet its customer needs. "It was perfect timing for us to initiate and develop these plants under the AZ Sun Program so that we could help diversify the ownership of these projects, which creates balance for our ratepayers," says Geisler. "It balances our risk as a company in operating these plants in order to maintain reliable energy service for our customers, and it allows us to still partner with third party developers." The developers benefit because APS is carrying the financial burden. The power utility has come a long way in a relatively short period of time developing its solar power distribution capacity from its own sources and from contract providers. That capacity has grown from 1 MW in 2001 to more than 362 MWs at present, serving the needs of 90,000 APS customers. The Paloma facility is also the first example where APS, the state's largest power utility, has partnered with the state's largest solar power developer, First Solar, headquartered in Tempe, Arizona. APS partnered with SOLON Corporation, a subsidiary of SOLON SE on the Cotton Center facility. The company's North American headquarters are located in Tucson, Arizona, which includes a manufacturing facility. When it comes to development of solar power, the state, APS, and municipalities like Gila Bend seem to really have their act together—starting with the state setting an RES to fuel renewable power development, followed by APS's willingness to make a substantial investment in its development. To meet and exceed its RES commitments, APS will have 3.4 million MW hours of renewable energy serving its customers by 2015, representing about 11 percent of total retail sales, with the goal of achieving 15 percent by 2025. Gila Bend's fast track approval process is also helping to make solar power projects a reality in a timely fashion. The Paloma power plant is a good example of that. APS signed the contract with First Solar to construct the project in February 2011, construction began in June, and the plant was declared commercially operational in September—aconstruction period of only four months. First Solar spokesperson Melanie Friedman says the company manufactures solar panels and builds solar power generation plants. It uses a ‘copy smart' technique for building its manufacturing plants so that each is very similar, and that philosophy carries forward to how it constructs power generating facilities. "The process that we have in place is what has enabled us to build solar power plants so efficiently and quickly," she says. Friedman added that the company's experience building large solar power generating facilities and working with the community of Gila Bend and with APS in its AZ Sun Program were also major contributors to how quickly the Paloma project was constructed and commissioned. "Both First Solar and APS have agreed that it is certainly the fastest we have ever developed a utility scale solar project," says Geisler. "First Solar has mentioned that they believe it is the fastest they have ever seen completed in the world for the same size project." Both solar projects are located in Gila Bend's new Solar Overlay Zone, which the municipality has designated as a geographic area for fast-tracking the permitting of new solar photovoltaic projects. Permitting in this area takes less than three months, instead of the typical one to two years. "It (Cotton Center) is clearly one of the easiest projects that we have developed in terms of moving the project forward at a very rapid pace," says Dan Alcombright, SOLON president and CEO. "Gila Bend has identified that it has a competitive advantage in the solar resource, as one of the prime locations in the country, both from a sun standpoint and also from an interconnection standpoint in serving Phoenix, one of the nation's largest population centers." He adds that the application and approval of a conditional use permit took about one-tenth the amount of time dealing with Gila Bend as it has taken SOLON when dealing with some other jurisdictions. APS has come a long way in a relatively short period of time developing its solar power distribution capacity from its own sources and from contract providers. That capacity has grown from 1 MW in 2001 to more than 362 MWs. Arizona still trails California in solar power production but is quickly moving up the top-ten ladder among American states, being driven largely by the RES the state has set for all local utilities. While it is the largest producer of solar power, California is also the top power consumer among the top 10, and Geisler says that explains why solar power in Arizona has so far developed at a slower pace compared to its neighbor. Its power consumer base is considerably smaller than California, but he has a strong feeling about Arizona's future capacity to continue to be a leader in solar power development, considering that the state receives over 350 days of sunshine and has a vast amount of flat land to support solar power investment. "I feel we have really just scratch-ed the surface," says Geisler. "This is a premier region for solar installation, not only throughout the country, but when compared to regions worldwide. There are a lot of variables that go into the potential and certainly land availability is key. I think we have a vast resource in available land that is capable of supporting solar development." However, given the intermittent nature of generating solar power, APS understands that it is important to have reliable back-up service from conventional generation to complement solar power. Geisler adds that another positive working in Arizona's favor in terms of solar power development is the number of developers situated in the state with the equipment and experience to bring projects on stream. "There is the availability of some industry-leading suppliers, manufacturers, and developers of solar technology and power plants, who are interested in developing these plants here in our region," says Geisler. "So when you put forth a solicitation to hire developers to construct some of these plants, we really are impressed and pleased to see the response from such an experienced and diverse group of developers. That is what has led to this being successful for us—the combination of being in a good region and partnering with very strong, experienced developers." Friedman says that First Solar's company founder is from Arizona, and the company views the American Southwest as one of its fastest growing markets. It is currently building a manufacturing facility in Mesa, Arizona. The local economy is definitely benefiting as a result. "Here in Phoenix, the housing market has been hard hit by the economic downturn, but those construction skills definitely translate into solar," she says. "So if you have previous experience building a house, we can definitely take those people and put them to work building solar power plants." SOLON president and CEO Alcombrightadds that workers are also very appreciative of the opportunity. "What was gratifying for me was going out to a cook-out for about 200 construction workers, mechanics, and electricians at our Gila Bend site, and the universal comment they had coming back to me was, 'thank you for this job.'"